100 Bay State Road is a food haven for hungry BU students. However, the bakery at Rize is a hidden gem. Every day the eatery makes a variety of delectable pastries--everything from red velvet cupcakes to cannolis. Rize offers a variety of options for breakfast, lunch or early dinner, but the most impressive is its option to create customizable cakes. When I first discovered the order form online, I was skeptical; the idea that I could have a cake made on campus and purchased with dining points seemed too good to be true. Nonetheless, I needed dessert for a last-minute Super Bowl party so I decided to take the risk. Upon receiving my cake, I was pleasantly surprised. The cake was simple and round but tastefully decorated with chocolate frosting patterns and chocolate dipped strawberries. I opted for vanilla cake with chocolate frosting, and my only other request was for “Go Broncos” to be written on it. From this, the bakery team deduced that I was a loyal fan and went above and beyond to personalize my order. They created a white chocolate replica of the team and drizzled the strawberries with Broncos colors. I was satisfied with the taste as well. The cake was moist but somewhat overpowered by the thick, decorative frosting. Although the frosting was a little sweet for my personal taste, the overall product consoled me when my team lost miserably last Sunday. The bakery team’s attention to detail is especially impressive and I strongly encourage others to take advantage of this service! The order form is easy to complete, but I have included some pointers to further streamline the process. Make sure to give Rize about 48 hours to process your order. Pick-up time is during regular store hours, which are 7 am to 5 pm, Monday through Friday. Be conscious of the prices! The cake itself costs $25, but it will feed 10 to 12 people and a personal message is included. Be aware that it costs $5 for one add-on, $7.50 for two and $9.50 for three. The “personal customization” add-on is an additional $10. 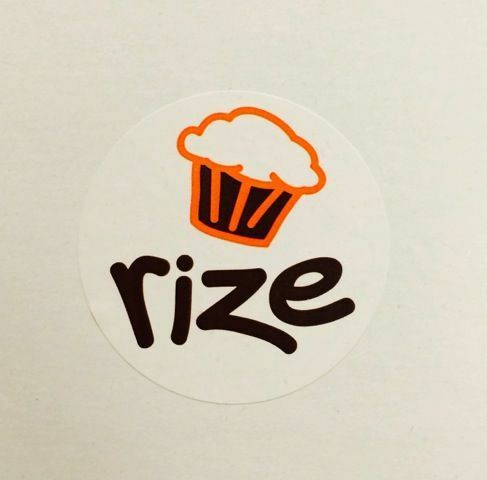 Rize takes Visa, MasterCard, dining points and convenience points. For those who may not know, Rize is located in the basement of 100 Bay State Road. Happy eating!